The weather outside is starting to cool down here. So it seemed like a good time to offer a wintery type of giveaway. 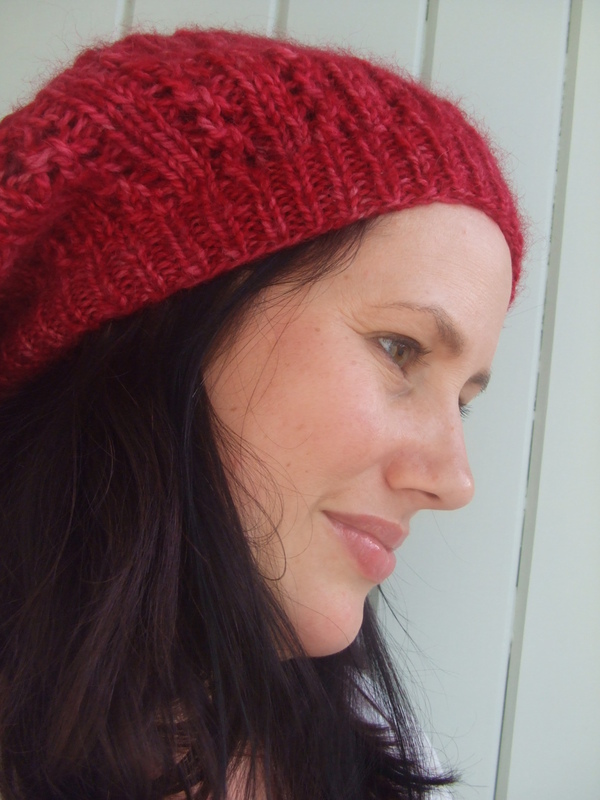 I’ve got three copies of my new Dolce Beret pattern to give away. 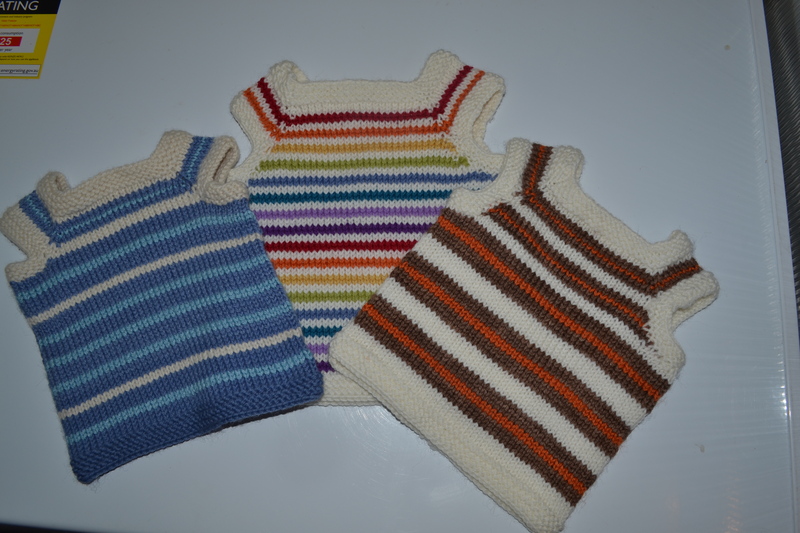 It comes in four sizes to fit from 2 year olds upwards, using DK weight for XS and S versions, and 10ply Worsted weight for the M and L versions. 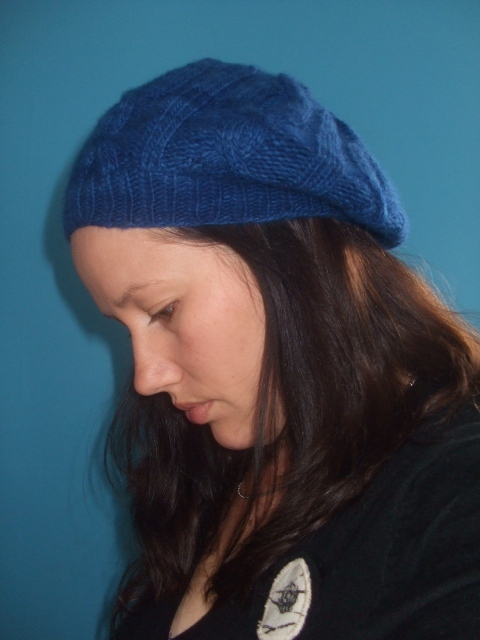 I also have three copies of the Calvados Beret pattern up for grabs. 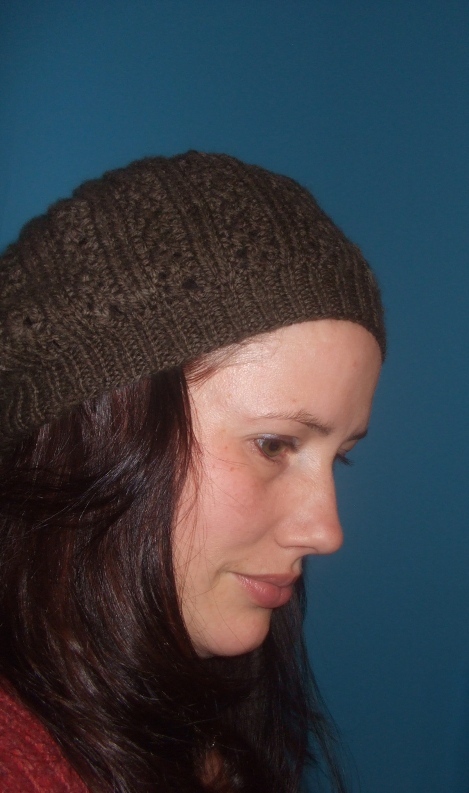 This is a cabled beret pattern to fit an average adult woman’s head. 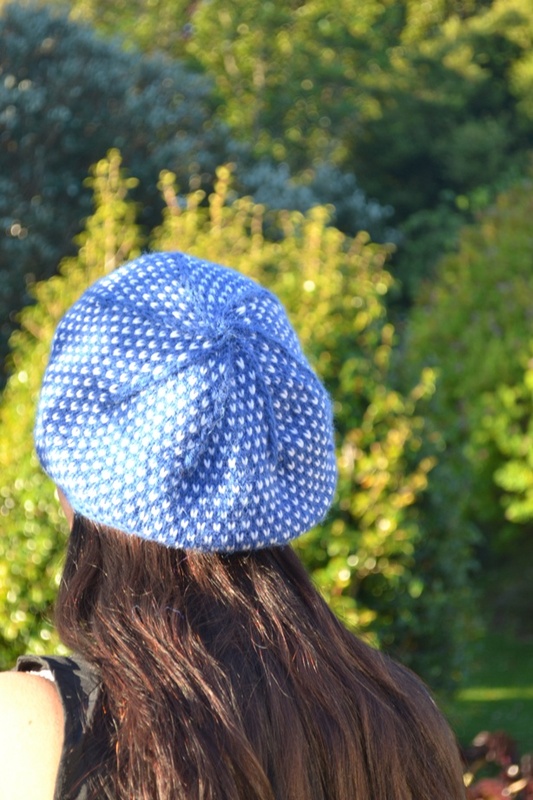 And… also one lucky person will win the large size Dolce Beret pictured above and below. 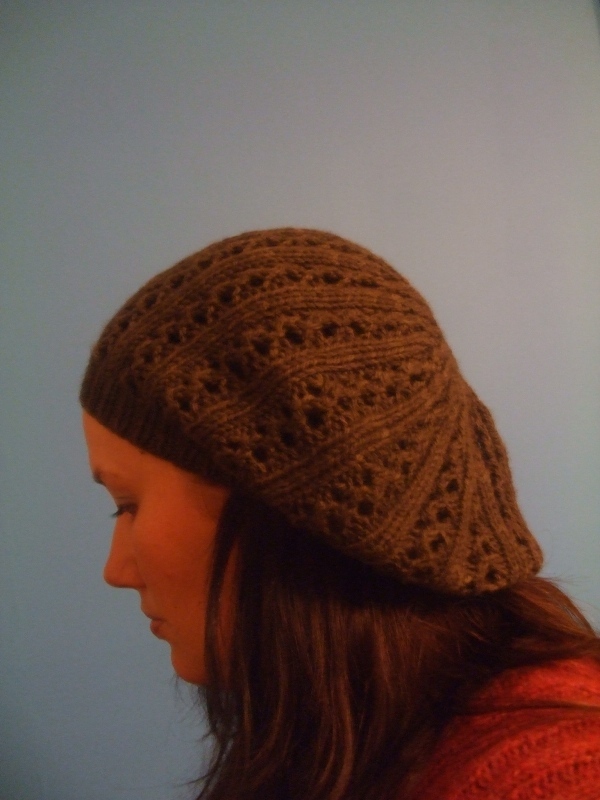 It is knit in 100 Pure Wool 3 ply worsted yarn in the colourway Chocolate. It is super soft and cosy. Whether it is approaching winter where you live, or whether you’re just leaving it behind, if you’re anything like me, even the coldest day can be brightened by a snuggly hand knit to shield you against the weather. This will certainly help you achieve this! So, how do you enter the draw? Leave a comment on this post telling me what you enjoy most about winter in the place that you live. Whether it’s your home, your town, or your country, what is the best part? I love living where I live because of the awesome winter time views I get of the mountain that’s almost in my backyard. The last time I saw it it was totally bare. But this was it this time last year. So what’s your favourite part of winter? Leave a comment here by Saturday evening 10pm NZ time and you will be in the draw to win. It’s amazing how you can find time to do things like work on finessing a pattern for release when you’re procrastinating. This week was senior report week at school, which means about 3000 words for each class needed to be written and results entered – everything is done electronically these days. It is certainly the sort of thing that makes you want to bury your head in the sand and do something a lot more creative. So working on this pattern was the perfect antidote. 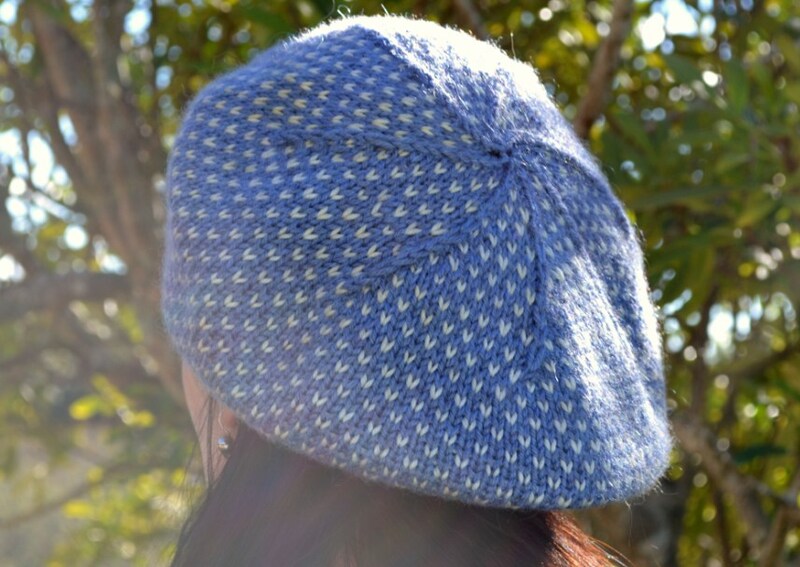 I loaded up the Calvados Beret Pattern onto Ravelry for sale last night. 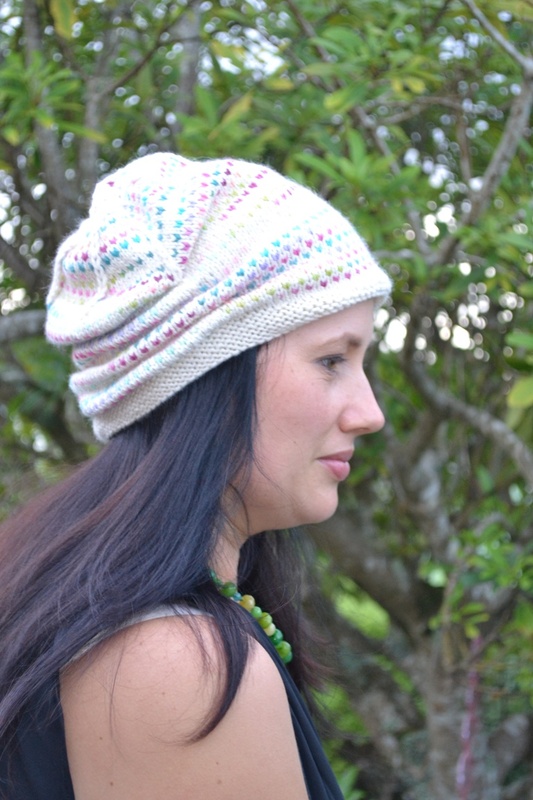 If you have been following my blog for a while you will probably recognise the hat above from when I first knit this pattern up. The first sample was knit from the same Jo Sharp Silkroad Aran Tweed yarn as my Calvados cardigan. This gorgeous cardigan pattern was released this week too which gave me the incentive to complete writing up my beret pattern. The final tweaking that I did was to add more uncharts. I first came across uncharts when I was knitting up my Nightsongs shawl. There is clearly interest in uncharts in the knitting community – my blog hits make for interesting reading at times and this post still draws a handful of visitors every day. Therefore all cable pattern is available as both a chart and an unchart, and the crown decreases are available both written and in an unchart. I hope that people enjoy the uncharts that I’ve included! The second sample was knit in Malabrigo Worsted, and took just 65g of yarn. It is soft and deliciously floppy to wear. 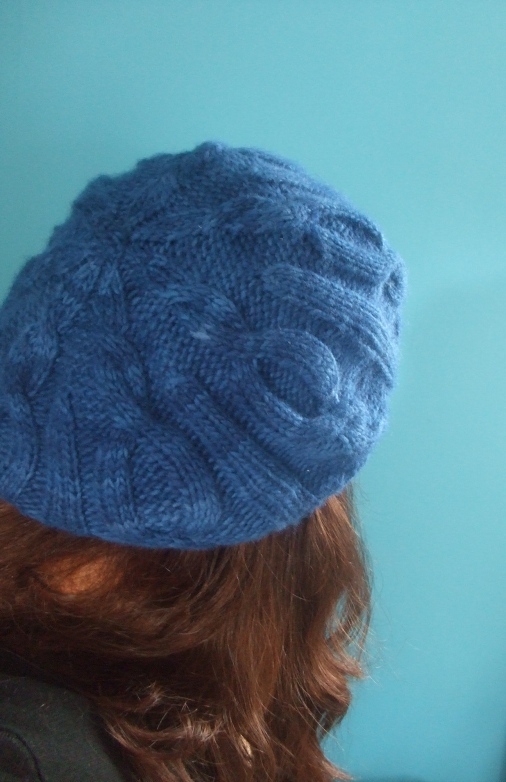 The pattern calls for the body of the hat to be knit on 4.5mm needles which maintains a firm fabric on the worsted weight yarn but would be suitable for Dk weight yarn too. My secret hat knitting of late has nearly all been shared with you now. 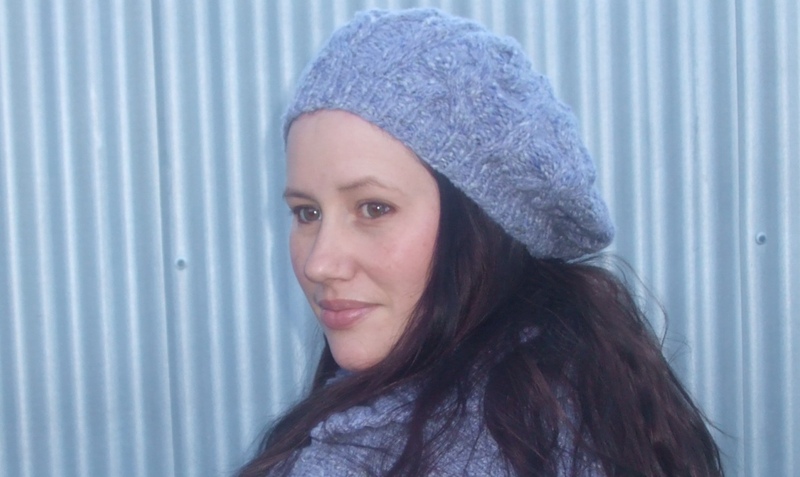 I have been working away on a second beret pattern, and this one is ready for release now. A bit earlier than I had planned to release it, but I had the world’s speediest and most dedicated testers, and I am stoked to say that I have loaded the pattern onto Ravelry tonight and it is now available for sale. 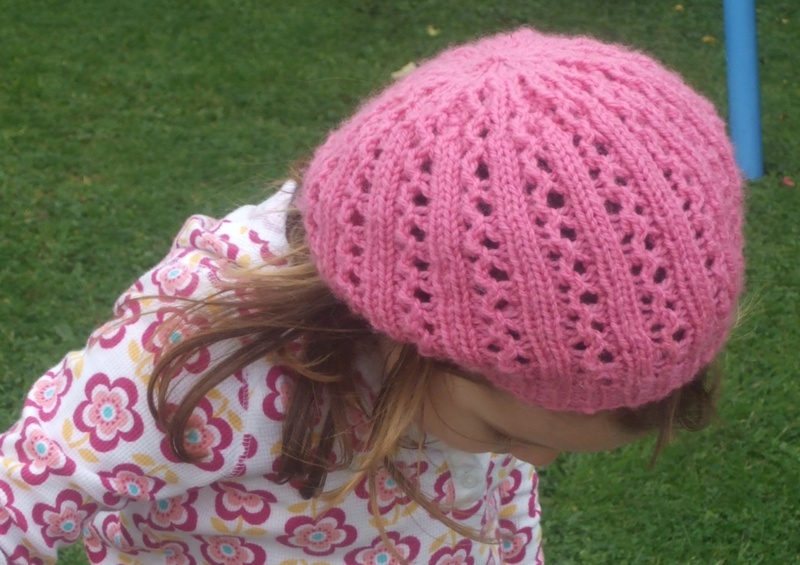 The pattern is the Dolce Beret. Using the simple lace pattern that the Dolce Socks and Toddler Socks employs, this beret is a really fast knit and very versatile pattern. It has four sizes: X-Small which fits from around 2 years (or 47-50cm head), and Small, both of which are knit in 8 ply/DK weight yarn, Medium and Large both are knit in 10ply /Worsted weight yarn. Large fits a fit 54-58cm head. Four different sizes, two different weight yarns. One versatile pattern. I have one more that I haven’t taken pictures of yet, and then all my secret hat knitting will finally be all in the open. Some secrets are worth keeping. I hope you like the pattern! Subscribe now and get one issue FREE! Yes, I have a confession to make. Back when I was on my yarn-buying ban, I had to indulge my knitting obsession in other ways. 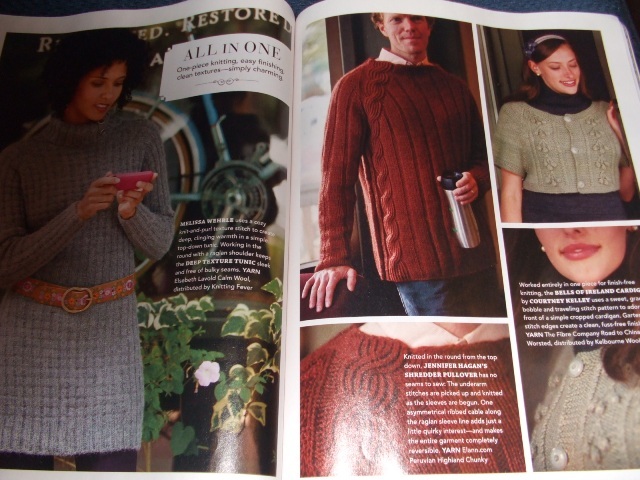 One way was to subscribe to Interweave Knits. I had bought the last few issues and have found them to consistently have at least two-three patterns I’d really like to knit, so it seems that they are probably a good buy for me. And, well, when you can get five issues for the price of four, and when the price you pay is approximately the price of *two* issues off the newstand here, including international postage, well, it seems like a no-brainer. My friend Sarah commented that she had seen the new issue in her local magazine shop on the weekend, so I was hopeful mine would arrive soon. And today, while I was surrounded by stacks of marking, it arrived. What a lovely lunch break I had today! The one problem with this issue is that it’s for Winter. And, I am informed, it is summer here. Hmmm, I’ll keep you informed on that one. So, while I am liking some of the patterns, it is likely to be a wee while before any of them hit my needles. Called Aquitane, it has a simple beauty, although I’ll have to watch that wide neckline! It is knit in the round from the bottom up, and has a fairly limited size range, but it *does* have my size, so that’s something! And my other two picks are both potential knits for DH. First up is the Shredder Pullover. And lookie, it uses the same cute cable as my Jimmy socks!! 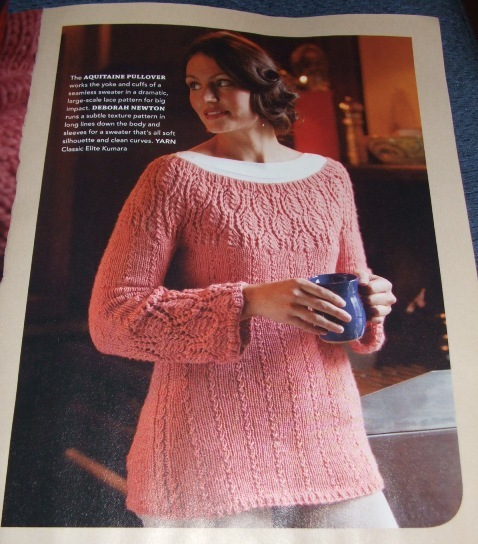 And, maybe not my thing with the colourwork, but I like the lines of this pullover too. This issue is the first regular issue with the new layout, which features themed groups of patterns initially photographed together and then with all instructions following. One commentator mentioned the seeming increase in full page advertisements that accompanies this change. I hadn’t noticed it so much in the Weekend edition, but certainly noticed it in this magazine. However I happen to quite like ads about knitting… so no complaints here. Overall, this is a nice issue with a balance of things that make me think “what on earth were they thinking?”, and “no, never”, a few “that’s nice” or “my mother would look good in that” in addition to the gems mentioned above. There are lots of women’s knits, a colourwork cardigan for young girls, and a handful of accessories (no socks this issue?). So, all in all, I like this issue, and I can see myself really enjoying my new subscription.